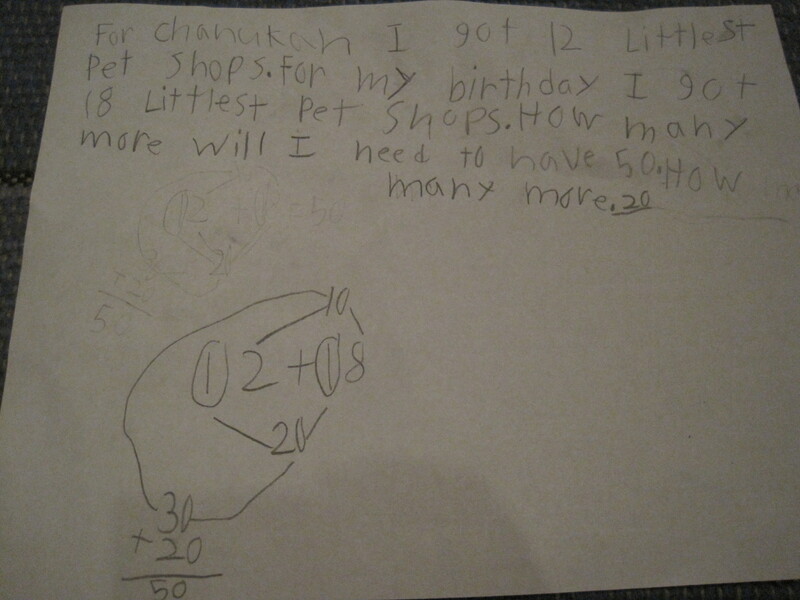 When Poppyseed wanted to know how to spell ‘Chanukah,’ I figured she was making a card. This wasn’t for any assignment. Poppyseed often sits down and comes up with word problems or equations. 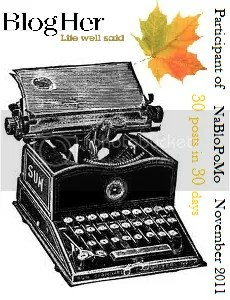 I suppose it is akin to filling my journals with stories and poems when I was young. She comes up with some meshuga way of checking her work. 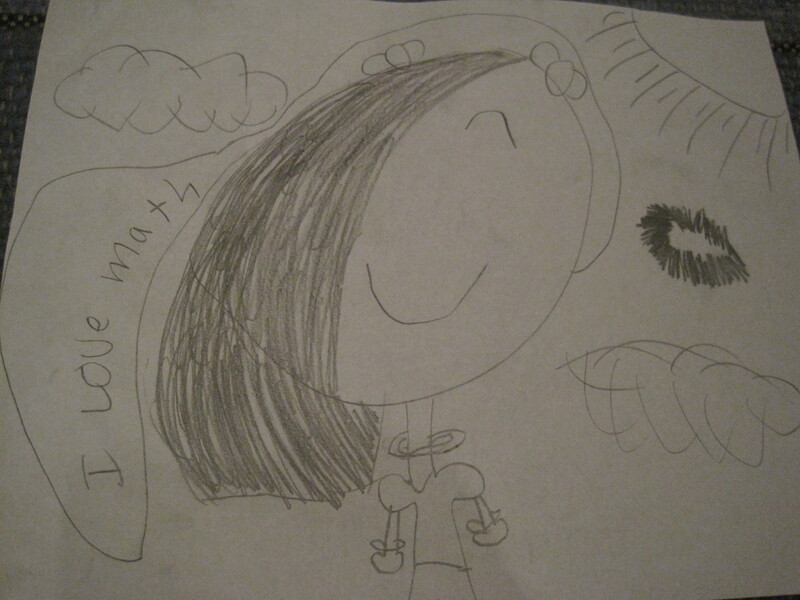 And then…she draws a picture. Who is this kid? Whose is this kid? I think “Chanukah” is one of the Hebrew words that has the most possible transliterations. Maybe you could suggest your daughter find them all. This made me giggle on a day when I really needed it. My kids too often do math equations for fun – completely blows my math-phobic mind. Who are these kids indeed? I’m so glad to have provided the much-needed comic relief. But I’m with you; I fail to see the fun. H is clearly already on the right path with finding the 10s. It is easier. Actually, that way of checking math is one my son learned in school (he’s in second grade). 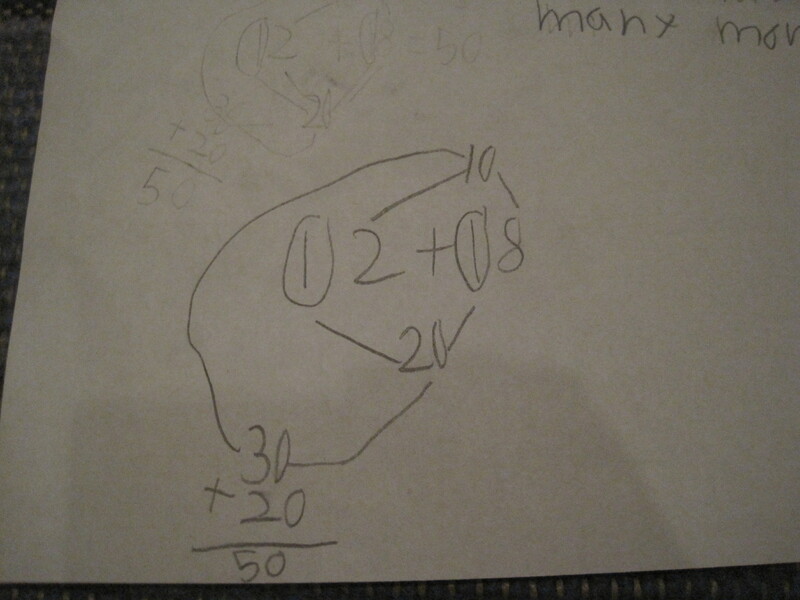 For his math homework, he does the same circling and same adding of different numbers. It’s completely different than how I learned it, but it works really well! Fortunately, thanks to the reading specialist at school and her daily reading clinic, Poppyseed has a book hidden under the covers as well. Which she comes by naturally. As a kid I would rather do math problems over reading or writing any day. Maybe she gets that from me. Shayla would prefer to sit and write a letter. Maybe she gets that from you ;). And the letters she writes are so funny! Maybe 😉 I’d love to correspond with her. I love mail! !